Note: I’d like to thank my buddy Wil Reynolds over at SEER Interactive for framing so perfectly in a talk of his what I had known intuitively for years but had never verbalized so well– clients care about outcomes, not outputs. Since then I’ve driven my team at MWI mad talking about this. Companies hire marketing agencies for one primary reason: to achieve a specific goal, often associated with an increase in sales. Many agencies, however, focus their time on providing deliverables and sometimes those deliverables are created without ROI being the primary goal. Here at MWI, we focus on the specific client goals and tie those goals into everything we do for our clients. We are keenly aware of the difference between outputs and outcomes. Output – Something you can check off. A task. Something that keeps you busy. Something you can easily show as being done. Outcome – A larger achievement or meeting a goal. Example – I want to run a 100K race. What is the outcome? Finishing the race (alive). What outputs are necessary to reach this outcome? Getting up today and running 20K, and then doing it again two more times this week. Outcomes do not happen without outputs, therefore we do not say outcome = good, output = bad. They are both necessary. What is bad is when we focus on outputs and forget about outcomes. This is human nature, especially in the workplace. It’s relatively easy for me to keep in mind that when I’m out running for training (output), I’m doing it to finish the big race (outcome), because it’s a lot of work to do the training, and if I didn’t keep the outcome in mind, I would quit doing the outputs. But at agencies, it’s different. 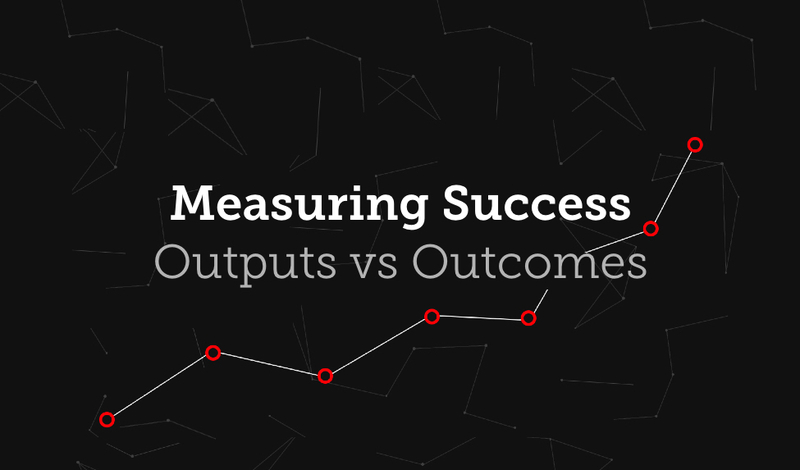 At agencies it’s easy to forget about outcomes. When a client asks “What the heck are you guys doing? I feel like I’m pouring money into a black hole and getting nothing out!” it’s easy for an agency to respond by displaying outputs. The response is “Oh, Mr. Client, we are ever so busy on your account! Here, look at all these things we’re doing! As you can see from this list of 250 tasks we’ve checked off, we are very, very busy and we are doing great things!” Over time, marketers can forget they are working toward an outcome, and become focused on making sure the client sees plenty of outputs. But why do clients hire agencies? Is it so that they can see task lists get checked off? Clients want results. They want to get quality leads. They want to sell product. They want to grow by 200% over the next 6 months. They want outcomes. If clients care about outcomes, not outputs, why do they talk so much about outputs? They haven’t been educated to focus on outcomes. They’re in between their marketing agency and their boss, and the boss is asking for proof that the agency spend is worth it, and there are no outcomes to show yet, so they ask for outputs. The client is nervous that no outputs are being produced and therefore no outcomes will be produced either. Finally, clients talk about outputs when marketers talk about outputs. When clients focus on outputs it’s lose-lose. We end up spending time on outputs that may or may not be necessary, just to look busy. We end up spending more time on reporting, rather than doing the work that produces outcomes. a. What is the desired outcome for this client? b. How does this task support that outcome? c. Can I do this task in a different way that is faster, but still produces the same results? Or can I do it in a way that produces a better result to support the outcome? At MWI, we never do a task just because “That’s the way we do it.” We tie every task, every time, directly to an outcome. We talk about outcomes with our clients. Is there a mutually agreed upon goal between MWI and our client? Does everyone know what the goal is? Are we 100% sure the client knows what the goal is? Does that goal form the basis of virtually all our conversations with clients? Talking about outcomes and outputs should be a common subject with clients. Our reporting should be structured around outcomes (we were able to increase conversions by 50% last month) not outputs (here are 10 tasks we completed last month). SEO efforts are a marathon, not a sprint. Sometimes with new SEO engagements, we need to tell clients they can expect to wait month, perhaps several months, to see results (outcomes). In the meantime, we can’t report on anything but outputs. This is necessary, but we still focus the conversations on outcomes by always pointing out how these outputs will lead to the desired outcomes. Growth is the only outcome that really matters. Profits are another good one. Sales aren’t bad. If sales can’t be tracked directly from marketing efforts, then leads are often the best substitute. But don’t fall into the trap of focusing on rankings, followers, share of voice, or other “intermediary” metrics that are important, but should never be the primary focus. At MWI we talk a lot about win-win partnerships. Sure, this is a “catchphrase” that is widely overused, I get that, but here we take it to heart and it shows. Every single client (or potential client) interaction we have is driven by this simple concept of win-win partnerships. The question we constantly ask ourselves is “if we are not constantly becoming better, as well as constantly making our clients better, than what’s the point?” This question is the engine that drives our passion for win-win partnerships; and all of our employees and clients see and feel the results of that day after day. If you’re ready to talk to a marketing agency that genuinely wants to see your business succeed, contact MWI today. We’d love to talk to you about how we can help grow your business.